Have you wondered how to help students understand character development? It's a VERY difficult skill for students to understand! 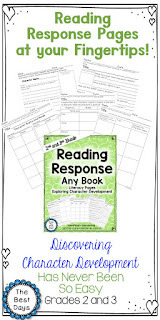 These Reading Response Literacy Pages will do the trick! They are designed to help students look closely at characters and, through this close reading, develop a skill set to break down characters to understand the hows and whys of what they do! Grab them now at The Best Days on TpT! Click the green star while you are there to follow me! Follow me at my blog or on Facebook too!